Fifth-grader Lucy Tanaka's attempt to surprise a classmate with a kind gesture goes wrong. 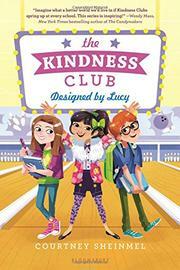 Following Chloe on the Bright Side (2016), this second episode in Sheinmel’s Kindness Club series stars designer-to-be Lucy Tanaka, who worries that her bond with friends Chloe Silver and Theo Barnes (both are white) will weaken if they aren’t always engaged in the acts of kindness their club stands for. Her latest idea is a surprise birthday party for classmate Serena Kappas at the Tanaka family’s bowling alley. Serena’s mother has just died. Mixed-race Lucy knows something about being motherless; her Afro-Japanese-American mother died when she was only 1, but it still makes her sad sometimes. But she’s sure a bowling party will make Serena’s day memorable. When it turns out that Lucy’s Japanese-American father, distracted by his failing business, hadn’t agreed and wasn’t in a position to supply a party, and worse, that Serena didn’t want it, Lucy feels horrible. Instead of making people happy, she made people sad. The author allows the complications to build slowly as she develops her title character and demonstrates the ins and outs of fifth-grade friendship. Lucy’s first-person narration reveals her wonderful creativity, her emotional fragility, and her generous but impulsive nature, which doesn’t always stop for second thoughts. Readers caught up in her worldview will applaud the resolution.